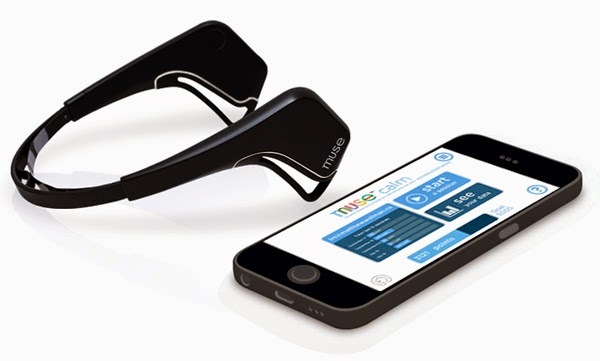 Cue in Monty Python‘s John Cleese: “And now for something completely different.” Meet Muse™, the brain sensing headband. In midst of emotional turmoil and stress of an unfamiliar environment, I neglected the most important thing in the world: my brain. It took me a while to notice how much my stress impacted the way I use my brain and by the time I did, I could barely concentrate on a serious task without going into either procrastination or panic mode. For someone who has always excelled in problem solving and critical and creative thinking, I felt completely paralyzed. Knowing that my writing is my livelihood, I freaked, of course, and then continued to ignore the problem for another couple of months. Over time, everything became more difficult. For a once prolific writer, all of a sudden a 400-word article started to feel like an entire book. I grew forgetful, scatter-brained, and, worst-of-all, insecure and irritable. It needed (and still needs) to stop. My first five minutes with Muse revealed my biggest fear: that my brain was distracted and easily discouraged. For example, the Calm application that accompanies the headband has the wearer do a series of simple exercises to map the brain. One is to think of as many song titles in under a minute. It was a struggle. My brain panicked under pressure and came up with almost nothing. That first session recorded my brain activity at only 42% calm. It’s been improving steadily with every use. Muse was developed by Ariel Garten, an artist-turned-psychotherapist-turned-entrepreneur and CEO of a tech startup InteraXon. “Our feelings about how we’re feeling are notoriously unreliable,” she claims in her 2011 TEDx talk. This certainly rings true to my current cognitive thinking, which is completely skewed. But, if one can visually see and understand how their brain operates, one can make adjustments? Makes sense to me. Sounds kind of Star Trek-y, I know. But I really do believe in exercising our brains the same way we exercise our bodies. A short brain training session takes place in under five minutes, so (pun intended) it’s a no brainier. This is the future. P.S. Although my experience with Muse is fairly new, I’m posting this now because, hey, it’s Christmas. I have the badass-looking black one, by the way. It also makes me think about the future of wearable technology, especially when combined with fashion. It’s coming!